If your garage door isn’t working properly, it’s time to pick up the phone and make a call to your local garage door repair company. It’s important to find a company you can trust—one that has experienced technicians who can perform the garage door spring, opener, or other repairs your garage door system needs. At Precision Garage Door of Houston, we’re proud to be your source for professional garage door service. More than 20,000 injuries are reported every year due to people who are unqualified trying to repair their garage doors. So to ensure your safety and the safety of your family, it’s crucial to hire a certified garage door technician who can perform the repairs properly. Our team at Precision Garage Door of Houston provides a variety of garage door services. Whether you need garage door spring repair, opener repairs, or something else, our skilled technicians can get your garage door working safely again. Your garage door wouldn’t be able to open and close properly if it wasn’t for the garage door springs. These heavy-duty springs undergo a lot of stress as they regularly extend and retract, which can cause them to wear out over time or malfunction. When this happens, the springs on your garage door will need to be replaced. Other problems can arise when the springs that are installed aren’t the appropriate size for you garage door system. This can cause the door to be unbalanced or it could close too quickly and with too much force. 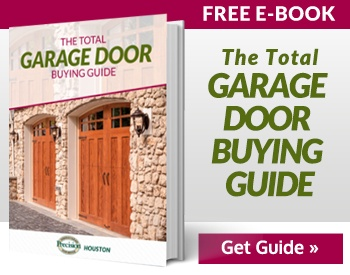 Not only will this cause more damage to your garage door system, it’s also very dangerous. A garage door repair technician will make sure that the correct springs are installed so your garage door closes smoothly and safely. When there’s an issue with the garage door opener, it can be a huge inconvenience. The opener is the motor responsible for opening and closing the garage door. If it malfunctions, you’ll need to have it professionally repaired or replaced before you can use your garage door safely again. More often than not, repairing the garage door opener means replacing one malfunctioning part, so most repairs are relatively quick to complete. However, some more serious problems could mean replacing the entire garage door opener. Your technician will be able to determine what’s the best course of action for repairing your garage door system. When you receive garage door service from Precision Garage Door of Houston, you’ll enjoy peace of mind knowing that our technicians are certified by the International Door Association. Our garage door experts are committed to providing you with the best garage door services in the area. We also keep up on the latest garage door repair techniques, regularly learning new skills to help us perform quick and professional garage door spring repairs, opener repairs, and more. When a Precision Door technician arrives at your home, we’ll come prepared with a truck full of the tools and parts we need to conduct any garage door repair service. We’ll inspect the door, locate the problem, and fix it promptly so you can use your garage as soon as possible. Whether your garage door needs service now or you’re merely planning for the future, Precision Garage Door of Houston is here to help. And with our 24-hour emergency service, you can enjoy immediate repairs when you need them most.